Our background is one evolved from metal working in the race car industry. There, we designed and manufactured race car chassis, chassis components and complete handmade sheet metal bodies. Our background in chassis engineering and fabrication of NASCAR and NHRA race cars has complimented our flawless and user-friendly designs of suppressor and machine gun products. With over 20 years experience of fabrication and welding of tubular and sheet metal products from aluminum to titanium we offer many services to the metal working industry as well as the firearms community. In 1996 TBA founder Todd Brueckmann had a suppressor installed on a Ruger MKII. Although this pistol was quiet, it lacked the ability to hit a phone book at 25 ft. Several trips back to the Class II manufacturer that built it, did not solve the problem. Having an extensive blend of metallurgy, machine work and design fabrication experience we applied for an FFL/SOT and fixed it ourselves. And that's how it all started. Our goal is to continue to provide products that outperform others and give a lifetime of hassle free performance, coupled with outstanding post purchase support. We continue to repair our competitors suppressors on a regular basis because despite there dominance in the industry, they cant be bothered with standing behind there product lines that got them there, but are not serviceable. Send them in. We can fix them. TBA Suppressors started in an 1000 square foot rental and now has over 14,000 square feet of state of the art CNC machining centers to guarantee precision and accuracy in everything we offer. This includes our complete line of suppressors for all calibers from .22- .338 caliber, As well as machine gun repair, short barreled rifles, AOW’s, Precision rifles and machining services. While we continue to bring innovative products to the market that no one else can, TBA Suppressors spends countless amounts of time in the R&D side of our business and it shows. Our Flawless reputation, innovation and product quality are why our customer base ranges from Game Departments and the SWAT/Tactical community all over the United States, to our over 100 stocking dealers from coast to coast, to our local customers in Ashland Virginia, and to the horn of Africa. Precise engineering from the fit to the finish are why it is easy for us to guarantee our products for a lifetime. TBA uses a Larson Davis LXT sound meter to test all of our own and our competitors' products. This meter is a digital meter and measures sound at the same rise time, and "A" weighted measurement of the industry standard B&K 2209. We tested and returned several meters we purchased early on when we were in our design phase. We metered sound on the LXT and the BK 2209 at the same time and over the course of 3 days and 3 different calibers tested the difference between the two was + or – .04 db. 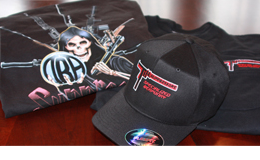 TBA Suppressors offers testing services for the independent manufacturer or individual by request.